When asked to write on healing and the Martial Arts, we almost begged off. We felt it was arrogant to think we could typify the Martial Arts or its sister arts, Tai Chi Chuan and Qi Gong as healing. Practicing these arts, and for that matter, engaging in any physical exercise can bring one to health, physically and mentally. It is, however, unrealistic enter a Martial Art program with the expectation that all your afflictions will be erased. It is misleading and fraudulent to say the arts of Tai Chi and Qi Gong in of themselves heal. Now before you throw food at your computer, let us go further into the meaning of the word heal. Synonyms listed were: cure, fix, mend, rehab, rehabilitate, set up. Does Practicing the Martial Arts Heal? Practicing the Martial Arts will impart cardiovascular and flexibility-inducing benefits because of all the stretching, jumping around, punching and kicking. But one can also pull a hamstring and/or induce serious injury practicing a spinning jump kick if you are not warmed up enough, poorly trained and over-zealous in your practice. One might then ask, where is the health or “healing” aspect in that? This does not mean to not practice these arts for your health. We are advising you to look at these arts as a means to a healthy lifestyle and not necessarily a cure-all. Hard or External Martial Arts are typified by punching and kicking, vigorous calisthenics and sometimes monitored sparring is required. If you feel drawn to this type of physical activity, by all means go for it. Watch a few Lessons at the School of your choice. You should not feel rushed or hurried to join a program. Bear in mind, Martial Arts in this category carry the greatest risk of injury if the instruction is improper and/or you are in a hurry to advance and not properly conditioned. Joint injuries, pulled muscles and ligaments and broken bones are common injuries seen in these Martial Arts. The benefits are great cardiovascular fitness, strength, increased flexibility, self-defense awareness and increased self-confidence that accompanies mastering a complex, physical skill. Ask yourself “what are my goals?” Self- defense? Confidence? Need to join an organized exercise program? Do you want to lose weight? “Kung-fu”, Wushu, Karate, Tae Kwon Do, Judo, Aikido and some others can provide all of the above. Tai Chi and Qi Gong are the least physically risky Arts to engage in. In traditional Chinese Martial Art culture, there is no difference between the hard martial arts and the “soft” ones. The hard Chinese Martial Arts, “Wushu” and the soft Tai Chi Chuan and Qi Gong, are considered two branches of the same tree. The jumping around, pyrotechnical Chinese Martial Arts that you see in movies are more commonly referred to as “Kung- Fu”. The term Kung-fu is a misnomer because it literally means “skill acquired through hard labors”. So an artist can have great kung-fu in painting, a carpenter, great kung-fu in woodworking. The term “Kung-Fu” can be applied to any craft. Kung-fu does not mean Bruce Lee, fighting or a spicy pork dish. Tai Chi and Qi Gong have garnered the reputation of being the “healing” Martial Arts because of the slow nature of the moves, deep, contemplative breathing and the focus required to memorize the moves. It is very abstract and nebulous which can hold your attention or may be too diffuse for you. Tai Chi and/or Qi Gong can help address and improve upon some health issues. The key word to bear in mind is can. There are documented studies of Tai Chi and Qi Gong helping with blood pressure, sleeplessness, anxiety and several medical issues. But this does not mean it will definitively cure these ailments. Studying Tai Chi and/or Qi Gong can increase focus, improve attention span, impart flexibility without strain and give a gentle strength to the muscles. After years of study, it can be understood as a self-defense tool, but it would be fool-hardy to think one’s self as a master of self-defense with a few years of Tai Chi under their belt. Tai Chi and Qi Gong would be better off thought of as a physical and mental self-improvement system. Where there is a temper, one can learn to calm down. Where there is a lack of confidence, one can gain self-esteem. When one has self-confidence, one does not need to walk around and prove anything. This can be true of studying the hard Martial Arts as well. As for both arts for self-defense use, the best fight is the one you are never in. Walk away, walk away, walk away from an escalating situation. No one wins in a physical fight. One may not be able to command others, but one can command oneself. This is truly what the Martial Arts imparts to those who study it seriously. Tai Chi, because of all the media attention it gets, also looks deceptively easy because the movements are slow in nature. This will attract novices on the onset. On a very surface level, one can feel better after one lesson. One can achieve some mental and physical benefits in a six week Adult Education course. But if one signs up for basket weaving, for which we hold nothing against, the next time around, the six weeks of training they undertook will be lost on them. If one continues their study and finds the movements diffuse, abstract and perhaps too slow or difficult to learn and ceases practicing, the training will be lost on them. If as a beginner, you find Tai Chi difficult, give it three years. Yes, three years. That is how long one needs to physically practice Tai Chi to truly reap any serious benefits. It took your Teacher twenty years to be able to teach you. An intrinsic part of learning Tai Chi is learning patience. In ancient times, Tai Chi masters would not take a student unless she or he knocked on their door every day for three months, and even then acceptance was not guaranteed. There is a saying, “after three years of practice, one then starts Tai Chi. We, as a whole, are a very impatient society. We have been trained to go somewhere else to fulfill our emptiness when not immediately gratified. The very nature of seriously undertaking Tai Chi practice is to teach temperance. It may sound like this article is attempting to discourage you from investigating the Martial Arts. Quite on the contrary. We are letting you know what the Instructor may expect from you. If you are already allowing this article to discourage you from investigating studying the Martial Arts, then perhaps they are not for you. If you wish to join as a serious beginner, you have a shot at success. Serious Beginners are always welcome at any Martial Art School. So, what are your goals? If you are looking for an “easy” exercise program to do because you haven’t worked out since high school and Tai Chi “looks so pretty to do”, Tai Chi may or may not be for you. Again, if you wish to explore Tai Chi as a serious beginner, you have a better shot at being successful in reaching your goals. If you are looking for Tai Chi to relieve chronic pain and/or injuries, you must first consult with your physician. Some of the moves, as gentle and innocuous as the may appear to be, may actually make a chronic condition or injury worse. It is inappropriate to put your Tai Chi Instructor in the position of a medical professional. Unless the Tai Chi Instructor is also a schooled physician, they cannot read an MRI or diagnose a serious medical issue. Be wary of any Tai Chi or Qi Gong instructor that claims that they can cure or heal you if you come to them with a serious medical issue. A truly professional Tai Chi Qi Gong instructor will know her or his limits, be willing to work in concert with your trusted physician’s recommendations and will enter your journey of recovery with you with the perspective of “let’s start with a few moves and let’s see what we can do for you”. As with Tai Chi, Qi Gong’s roots date back to 4,000 years in China’s history. It was primarily used in conjunction with acupuncture as a modality for improving health. Qi Gong is a little easier to follow and does not require the memorization that learning Tai Chi does. However, you will get greater mental and physical benefits if you work to commit your Teacher’s Qi Gong moves to memory and not just rely on just following your Teacher each time you attend your lesson. Most Qi Gong lessons are conducted with everyone following the Teacher, whereas in Tai Chi, the Teacher may show you a few moves, you practice them and commit them to memory. When the Tai Chi Teacher thinks you are ready to take on more, you are given more progressions until you finish the set of choreographed moves. So in this case, one might find the curriculum of Qi Gong less physically demanding than Tai Chi. There are hundreds of schools of Qi Gong thought and movement curriculum; there is no one way of Qi Gong that is correct. Approach learning Tai Chi and/or Qi Gong with an open mind and not expecting it to definitely relieve your complaints. The boundary between practicing this art for health and/or as an allopathic or holistic medical cure is a very fine one. If you are not very flexible and have not worked out for a long time, Tai Chi And/or Qi Gong may be for you. To truly reap any benefits from Tai Chi and/or Qi Gong, one must be willing to put practice time in outside of the established Lesson. It is akin to learning a language or musical instrument. With all the pros and cons mentioned here, all serious Students could not imagine their lives without their Martial Art training. Once bitten by the Martial Arts bug, serious Students find it hard to be be “cured” of their burning desire to train. To reap benefits from any fitness program, one must engage in it consistently. To put it simply, the best exercise is the one you do. So can practicing the Martial Arts “heal” you? You might find that practicing the Arts ignites a fire under you. You cannot wait to go Lesson and you buy every kung-fu video in Best Buy. You know the names of every Martial Arts star. You no longer smoke. You’re losing weight and you need new clothes. You are making new friends with like-minded goals. Your life is changing. Great. In this case, the Martial Arts has enhanced your life. In closing, the Martial Arts can provide a great tool for self-examination if one is searching for something that they have not found in conventional exercise programs and/or religious or spiritual outlooks. Practiced wisely, it can provide enormous physical benefits. Do your research, work with your trusted physician before engaging in any physical fitness program and go on what perhaps will be a life-changing journey with an open mind and open heart. “The best time to plant a bamboo tree was forty years ago. The second best time is now.” ~ Chinese proverb. All material provided on this page, links and/or Cynthia Ming’s Tai Chi Fitness is for informational or educational purposes only and should not be construed as a substitute for medical advice. Please consult a qualified health practitioner regarding matters of personal well being. The content of this article is protected by copyright under United States Laws. All content on this site including text, graphics, logos, images, audio clips and software is the property of Cynthia Ming and Cynthia Ming’s Tai Chi Fitness. © 1995-2012, www.taichi-fitness.com, Lao Shir Cynthia Ming. All rights reserved. Lao Shir (Venerated Teacher) Cynthia “Cindy” Ming is honored to be celebrating her 42nd year in the Martial Arts and Holistic Fitness. In 1985, ’86 and ’87, she traveled to Mainland China to further her training and to become certified by Coach Wu Bin and several other Grandmasters of the Beijing Wu Shu Team at the Beijing Sports and Cultural School and The Beijing Institute Of Physical Education, the “Harvard” of sports universities in Mainland China. The Beijing Sports and Cultural School is the training ground and performance team of world class martial artist and movie star, Jet Li. She has served on the faculties of the New York Open Center, The New School for Social Research and Columbia University’s Adult Education Alternatives Program. She achieved top ten level status as a regional forms competitor. 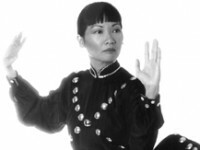 In 1988, she was awarded Honorary All Event Athlete, Women’s Division in the East Coast Wu Shu National Championships. She has been featured on television and in national magazines. In 1991, she was appeared prominently in a full page in the Joe Weider publication, FLEX, a professional bodybuilding magazine. She has the distinction of being one of the few martial artists the magazine has featured. Her specialty is modifying movements so anyone can achieve success in developing their ultimate human movement potential. Lao Shir Ming finds these three motivational quotes particulary helpful in reaching goals. “It’s always your next move.” ~ Napolean Hill, motivational speaker. Lovely piece on martial arts and healing as I lay down connected to the vibrant wonder of chi flowing through me as I write. Rich.